(Phys.org)—A team of researchers with the University of Connecticut, Harvard University and the Hebrew University in Israel has found that climate conditions in the southern Levant during the Younger Dryas were as cool as other studies have shown, but conditions were not as dry as expected. In their paper published in Proceedings of the National Academy of Sciences, the team describes their study of gazelle teeth fossils, believed to have come from victims of human hunters during the Younger Dryas. Several studies have provided evidence of a downturn in the global climate over the years 12,900 to 11,500 BP, a time that has come to be known as the Younger Dryas. Most climate scientists believe it was the first step towards glacial conditions. In this new effort, the researchers used carbon isotope measurements taken from the tooth enamel of gazelles believed to have been killed by human hunters known as the Natufians, to date the fossils which were found among other Natufian artifacts in caves in western Galilee—a part of modern Israel. The time frame of the fossils puts them in the Younger Dryas and the analysis also allowed for indirectly measuring the amount of water that was available during the same time period. Testing showed that the area did experience cooler temperatures, confirming findings by other researchers, but the area was not as dry as the researchers had expected. They were not dryer than the Bølling-Allerød period, for example, which occurred during the final stages of the last glacial period. The researchers suggest that the cooler conditions caused the Natufians to create settlements in the area, reducing the roaming that occurred as part of their hunter/gatherer efforts. Also, because of the relatively stable conditions, they believe the establishment of settlements eventually led to the domestication of wild cereals, which led to the first known instances of agriculture. The Natufian people lived from approximately 12,500 to 9,500 BC in the Levant, a region of the Middle East that now is mapped to Cypress, Israel, Jordan, Egypt, Lebanon Syria, Turkey and Palestine and they are thought to have decedents that were the people who built the first Neolithic settlements in the area. 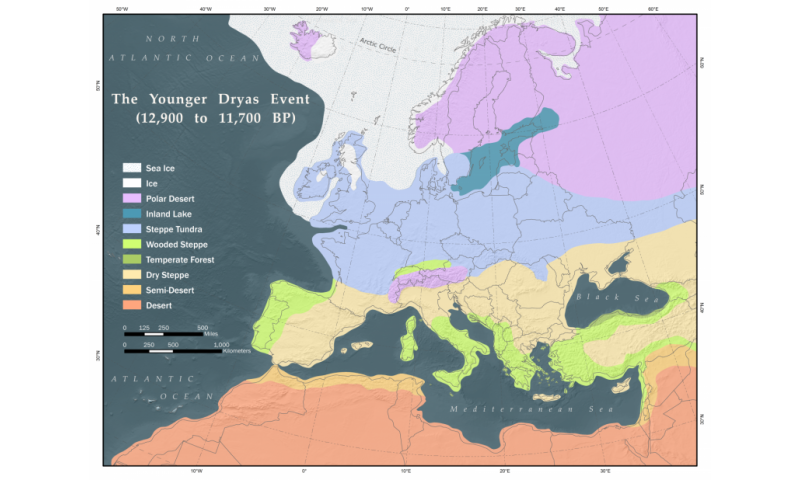 The climatic downturn known globally as the Younger Dryas (YD; ∼12,900–11,500 BP) has frequently been cited as a prime mover of agricultural origins and has thus inspired enthusiastic debate over its local impact. This study presents seasonal climatic data from the southern Levant obtained from the sequential sampling of gazelle tooth carbonates from the Early and Late Natufian archaeological sites of Hayonim and Hilazon Tachtit Caves (western Galilee, Israel). Our results challenge the entrenched model that assumes that warm temperatures and high precipitation are synonymous with climatic amelioration and cold and wet conditions are combined in climatic downturns. Enamel carbon isotope values from teeth of human-hunted gazelle dating before and during the YD provide a proxy measure for water availability during plant growth. They reveal that although the YD was cooler, it was not drier than the preceding Bølling–Allerød. In addition, the magnitude of the seasonal curve constructed from oxygen isotopes is significantly dampened during the YD, indicating that cooling was most pronounced in the growing season. Cool temperatures likely affected the productivity of staple wild cereal resources. We hypothesize that human groups responded by shifting settlement strategies—increasing population mobility and perhaps moving to the warmer Jordan Valley where wild cereals were more productive and stable.